What innovations in floating wind can be applied to the oil and gas market? Floating wind solutions have been evolving over the past few years and the leading float solutions being tested are generally robust and have adopted relatively conservative forms developed in the O&G industry. Many solutions are also being developed, but the experience from O&G industry shows us it can be a long and difficult path to technology readiness - requiring investments which may never see a return. To support the productive unit whether it be power gen, process or other plant. To do this efficiently, reliably and safely. Furthermore, we aim to do so within the prevailing commercial landscapes. Indeed it is often commercial pressure that drives the acceleration of innovation to meet new market needs. By way of example INTECSEA’s Low Motion Technology offers enhanced motions and stability of the substructure which enables cost reduction in moorings, riser/umbilicals/cables and in the plant it supports. Lower motions reduce the loads on the plant and it’s associated structure and systems. This enabler of lower cost development became more attractive with the oil price decline of 2014. For floating wind to become commercially viable it needs to deliver a significantly lower LCOE than current test facilities are achieving. The trend here is in the right direction but it arguably this will need further evolution and innovation in the form of larger turbines (already looking to >12MW) and float efficiency. Fabrication effort is a major factor here as floats will be mass produced so the optimum float solution will not necessarily be the lowest material cost/weight option. There are more than 30 float solutions under development all hoping to deliver the winning float solution. It is an interesting race and while the leaders are setting the pace there are still a many laps to go. 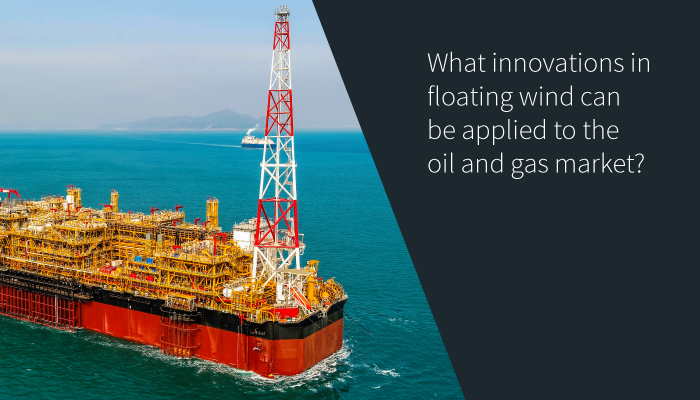 While there is a great focus on transfer of knowledge from the oil & gas industry to floating wind, what might be the innovations in floating wind that can be applied to the O&G market? Does the offshore industry still need engineering firms?